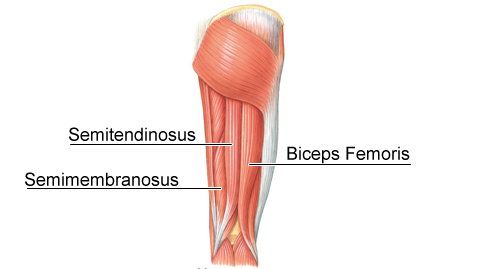 The hamstrings are a collection of three separate muscles that lie at the back of the thigh; Biceps femoris, Semi tendinosus and Semi membranosus. The hamstrings are polycarticular, meaning that they cross more than one joint. They are involved in: flexion of knee joint and extension of hip joint. Tight hamstrings can cause posterior (backward) tilting of the pelvis leading to the muscles of the lower back becoming strained. When the hamstrings are tight forward folding is then often initiated from the lower back and not the hips or pelvis, leading to further strain of the lower back. Hamstring injuries are very common and can occur during a yoga practice when students force themselves too far in a posture or from a forceful adjustment from a teacher. The hamstring tendons close to their origin at the sitting bones have very limited blood supply and injuries here can take months if not years to heal. Prevention is much better than the cure in this case. Once we have an understanding of why a muscle is tight we can then attempt to lengthen it. If a muscle is tight because of weakness then stretching it will only make it weaker. The focus here instead should be on strengthening. If in doubt add a mixture of strengthening and stretching into your yoga practice. When stretching the Hamstrings it is important to isolate the full breadth of the muscle group. Forward folds with the feet hip distance apart will target the more central area while forward folds with feet wide apart will target the medial area. Standing forward folds with feet crossed will target the more lateral aspects.